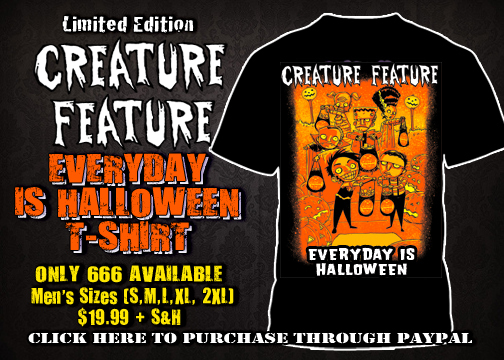 Brand New Creature Feature 4th Annual ‘Everyday Is Halloween’ T-Shirt! It’s come to our attention that in the hustle and bustle of the season’s creepiest holiday, we forgot to release our annual ‘Everyday Is Halloween’ limited edition T-shirt. So we’ve decided to rectify that gratuitous error and celebrate Halloween in January. 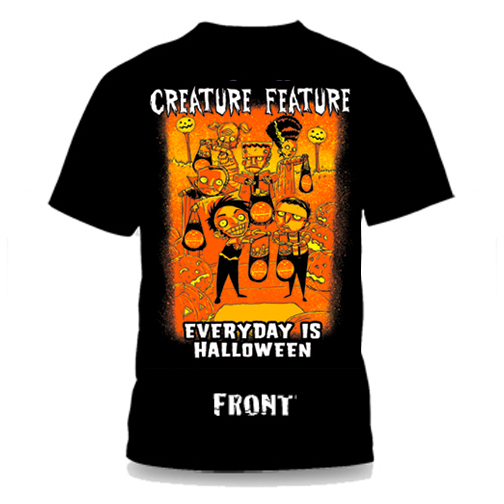 Our 4th annual ‘Everyday Is Halloween” shirt depicts a group of trick-or-treaters dressed as they’re favorite classic monsters. You have Dracula, Frankenstein, The Bride Of Frankenstein, The Creature From The Black Lagoon, and two other equally ghoulish beings, Erik X and I. Why wait until October to celebrate the greatest holiday, when you can make Halloween 365 days a year. The shirt is single sided and limited to only 666 pieces. They are $19.99 (plus shipping & handling) and come in mens sizes: Small, Medium, Large, X-large, & 2X). Artwork by the amazing Thomas Boatwright. Please note that this is a pre-order and all shirts will be shipped on the second week of February. Click the links below to order your shirt today through Paypal or head to our official store by clicking on the “STORE” link in the navigation bar above.